C. F. Martin 1-C Model Concert Ukulele, c. 1963, made in Nazareth, PA, natural lacquer finish, mahogany body and neck, rosewood fingerboard, original black chipboard case. This is a simply superb example of one of our most requested instruments: an older Martin Concert uke. 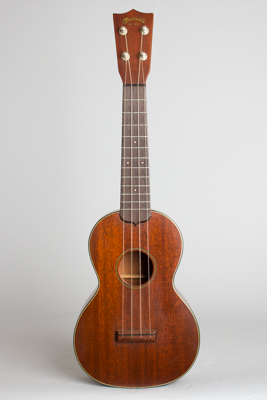 The concert size ukulele is somewhat bigger than the soprano but smaller and more "uke-like" in feel than the tenor; it is essentially a 4-string version of the 1920s Martin taro-patch. The larger body and longer neck give not only a deeper, richer tone, but the fingerboard has a lot more room for advanced modern uke stylings. This Style 1-C dates to 1963 or '64 (the original price tag is still included showing the list price for that year) and is in as close to perfect condition as we generally expect to see, with a great sound as well. Overall length is 23 1/2 in. (59.7 cm. ), 7 3/4 in. (19.7 cm.) wide at lower bout, and 2 3/4 in. (7 cm.) in depth at side, taken at the end block. Scale length is 15 in. (381 mm.). Width of nut is 1 3/8 in. (35 mm.). All original; untouched except for the very lightest of strum marks and a couple of tiny dings on the side. A real time capsule instrument complete in its original case with some period strings and the original price tag. Excellent + Condition.